On a journey without end. To find a special friend. Then I caught your smile. And our friendship has grown. Is all we've ever known. Good times as well as tears. Your friend throughout the years. The single CZ represents the person looking for that special friend. Traveling through the journey, once found, the bond of friendship grows stronger each day as shown by the CZ's growing bigger along the way. .925 Sterling Silver Pendant measures 27mm (1 1/16") long including bale and 22mm (13/16") wide and comes with and 18 inch Sterling Silver Chain. 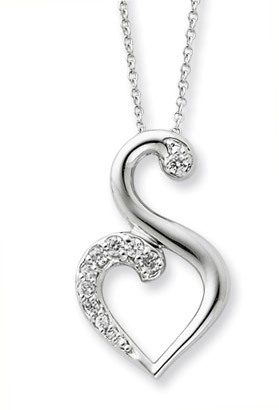 We guarantee our Journey of Friendship Sterling Silver Pendant to be high quality, authentic jewelry, as described above.